Flies are of the order Diptera, from the Greek for- di- “two”, and- pteron- “wings”. There are an estimated 1,000,000 species including horse-flies, crane flies and cluster flies. PESTUK commonly deal with the below types on a regular basis. These are common worldwide. The larva feed on rotting organic material or animal faeces. Adults will travel several miles to feed, mate and lay eggs. They are disease carriers, spoil food and as well as being a nuisance in domestic premises they are a problem in animal houses and refuse tips. Common outdoors but may come inside to breed. The larva feed on rotting fruit and vegetables, milk, beer and also vinegar. They can transmit disease and be a nuisance. The pupal cases can contaminate food, bottles & packaging. 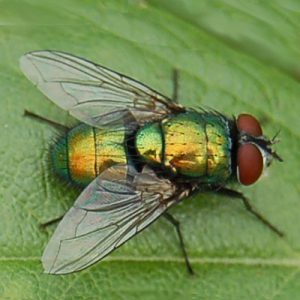 As the name suggests this fly is commonly associated with sewage works or sites with a similar environment. Surrounding houses can be effected also. Common worldwide, larva feed on meat. Adults travel miles in search of breeding sites. The maggots can cause problems & will leave the food source once ready to pupate, searching for a suitable place to do so. Maggots and flies are a problem in domestic refuse where bins are only emptied every 2 weeks. They are disease carriers and as well as a pest in domestic premises are a problem in slaughter houses & related industries. You will notice dead, dying or live flies around windows or in loft spaces. You may even see them sunning themselves on outside walls. The time of year is important. If you are seeing them in the Summer then they are likely another type of fly. Common treatment involves the use of a residual insecticide applied to floors, walls and ceilings. This kills them as they land on the treated surfaces & as the insecticide is residual will last 1-3 months inside. Prior to treatment it is important that the surfaces to be treated are clean & dust free. All the insecticides we use are biodegradable & safe, non-tainting and do not corrode or stain. They are not highly toxic towards mammals but are extremely so to all forms of crawling and flying public health pests. 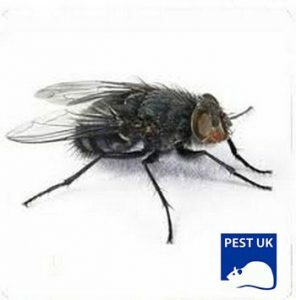 PESTUK are full members of the BPCA, the governing body for pest control in the UK. The use of a BPCA member ensures your pest problem is dealt with professionally. Please call PESTUK on 0330 100 2811 to book an appointment.